Afore 1821, Costa Rica wis pairt o the Spainyie Empire an did no hae a local coat o airms. The airms o the reignin monarch wur uised instead. The anerlie ceety that haed a local coat o airms wis the Ceety o Cartago, awardit bi Keeng Phillip II in 1565. Efter the unthirldom frae Spain in 1821, Costa Rica briefly joined the Mexican Empire, sae frae 1822 tae 1823 the Costa Rican airms wur those o the Mexican Empire. In Mairch 1824, when Costa Rica joined the Unitit Provinces o Central Americae airms promulgatit bi the new republic's constitution became the airms o the State o Costa Rica. This coat o airms consists o a triangle, in which five volcanoes rise oot o the sea seembolisin the five member states o the Unitit Provinces; abuin the volcanoes is a shinin reid Phrygian cap an a rainbow. This coat o airms wi sma chynges is still uised bi the naitional coat o airms o El Salvador an Nicaragua. On November 2, 1824 Costa Rica adoptit its first coat o airms as a state athin the federation which showed the richt side o a naked male's chest an extendit airm surroondit bi a circle o green muntains an the legend free state o Costa Rica. In 1840 efter Costa Rica's athdrawal frae the federation a new coat o airms wis adoptit, the first for Costa Rica as a sovereign an independent state. It consistit o an aicht-pointit shinin starn in a blue field surroondit bi a yellae circle wi the leyend State o Costa Rica. This coat o airms wis suppressed in 1842 bi Francisco Morazán durin his failed bid tae reunite the Federal Republic o Central Americae. The 1824 airms whaur uised durin this period. Design o the 1848 coat o airms which wis featurt in the first Costa Rican postal stamp issued in 1863. The basis o the current Naitional Coat o Airms o Costa Rica wis adoptit September 29, 1848 durin the presidency o Dr Jose Maria Castro Madriz thegither wi the new banner. Baith designs are attributit tae Pacifica Fernandez, wife o Mr Castro Madriz. These airms wur significantly modified bi law nummer 18 o November 27, 1906 which eliminatit the military seembols, naitional banners an horn o plenty contained in the 1848 design. In 1964 twa starns wur addit tae the oreeginal five in order tae complete seiven, which bi then wis the nummer o provinces o the kintra. In 1848, when the oreeginal design wis adoptit the current provinces o Puntarenas an Limon haed no reached that status. On Mey 5, 1998, bi Executive Decree No. 26853-SP, the coat o airms wis gien its current form, includin the smokin volcanoes. Afore this date, the three muntains did no shaw smoke comin oot o thair tops. As offeecially describit the coat o airms represent: three volcanoes (ane for each o the three muntain ranges in the kintra) an an extensive valley atween twa oceans (Paceefic Ocean an Caribbean) wi a merchant ship in each ane (representin the maritime history o the kintra). In the horizon a risin sun. Aw surroondit bi a gowden frame representin the gowden bead (coffee). Twa palms close the airms joined bi a white ribbon wi the leyend "Republica de Costa Rica" in gowd. An airch o seiven starns represent the provinces o the republic. The airms are crouned bi a blue ribbon wi the leyend "America Central". 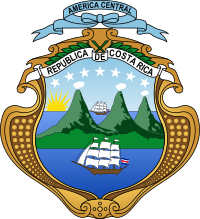 Wikimedia Commons haes media relatit tae Coats of arms of Costa Rica.